Martin Kasprowicz and Shannah Findlay with their awards. Each year Stonehaven Community Council hands out honours to an under-18 and an adult in recognition of their contribution to the area. On Thursday night, Provost Bill Howatson presented Shannah Findlay and Martin Kasprowicz with their prizes. Shannah was given the Hannah Dyson award, which is named in memory of a teenager from Netherley who died in 2005 after a long battle with cystic fibrosis. Now in its 14th year, the accolade is given to a youngster who shows outstanding achievement, excellence or merit. 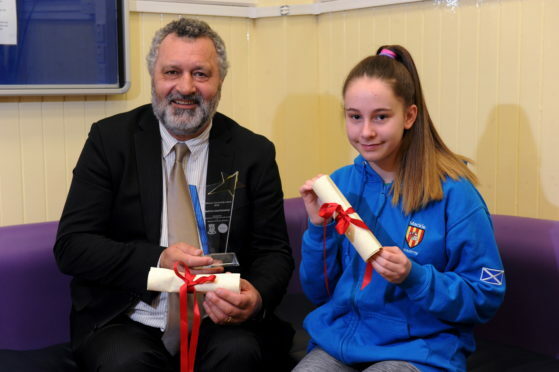 Shannah, a fourth year pupil at Mackie Academy, was nominated by Duncan Whyte, principal teacher of pupil support and attainment. Mr Whyte’s nomination praised the young carer for the impact she has had on her classmates and teachers. He wrote: “Shannah can only be described as a model pupil who has built very good relationships with teaching staff and peers alike and Shannah has an extremely positive effect on everyone she meets. Meanwhile, Mr Kasprowicz was given the community award, which is also sponsored by the local business association, for his charity work in the town over the years. The 64-year-old, a retired social work boss, organises the annual Stonehaven Super Quiz each year, which has raised about £50,000 for various organisations since it was launched. Mr Kasprowicz said he was “humbled” to receive the award as he gears up for this year’s quiz, which takes place on May 24. “It’s quite humbling to be given the award because it’s by the local community, it’s a very good feeling. “I think it’s natural to get involved in the local community, that’s how you meet people and make friends. I have been helping out for quite a few years. Tickets are still available for the quiz, which starts at 7pm in the town hall, and can be purchased by contacting Mr Kasprowicz on 01569 766151.